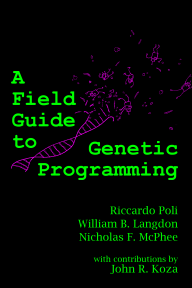 A Field Guide to Genetic Programming: Field Guide sightings! Many thanks to all these folks for helping spread the word. Given our non-standard publishing and distribution model, we're particularly dependent on this sort of word of mouth support. Feel free to let us know if you've posted a plug for the book (in the comments or authors AT gp-field-guide DOT org DOT uk). 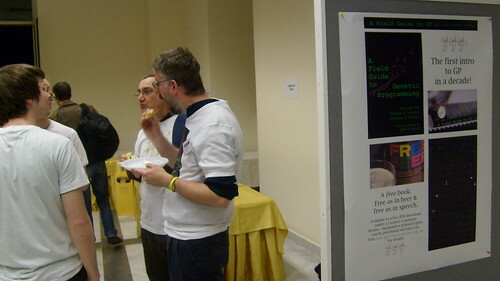 We're also looking for photos (like the one above from JJ Merelo) from the grand unveiling at EvoStar/EuroGP Wednesday in Naples, so please pass along those as well. I also could not resist plugging your wonderful field guide! The book is very good. I am enjoying it immensely! Thanks for the plug, and thanks for letting us know.